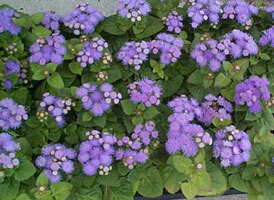 Ageratum are among the prettiest garden blues, growing well in sun or partial shade, from early summer to frost. They are also easy to grow, producing a profusion of fluffy flowers all season long. They are excellent plants for beginner gardeners. The blues are most popular, providing colorful accent. Flower colors also include pink and white. 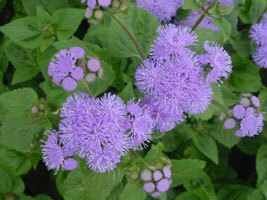 Ageratum are native to tropical regions of South and Central America. 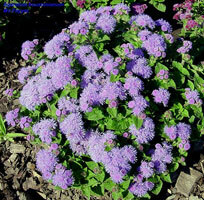 Their size and color makes Ageratum good candidates for rock gardens, flower beds, and containers. Ageratum is much used in public gardens to bring a missing blue note to bedding patterns. Plants are generally available at garden centers, color selection ranging now from the traditional powdery blue to pink and white. When sown in the greenhouse in early May, the flowering starts in the latter part of July and continues until the first frost kills the plants. Floss flowers are very frost-tender and should not be planted out too early. The old, brownish flowerheads remain on the plants unless removed regularly. The beds also need to be mulched, since otherwise the soft foliage will collect dirt in summer rains. This problem is much less visible with the tall-growing floss flowers. They keep very well in water and can be dried without losing too much of their color. The blue of the flowers looks magic in twilight, so try to place them so that they will catch the last diffused rays of the evening sun. 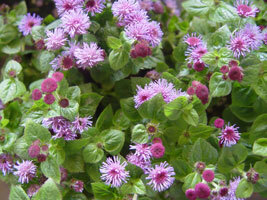 Ageratum are grown from seeds. Sow outdoors after all danger of frost. Or, start indoors 6-8 weeks before the last frost date for your area. Ageratum prefer full sun to partial shade. They will tolerate a fair amount of shade. They will do well in both average and poor soils. They are tolerant dry soil conditions. Space plants 6-8 inches apart.Water well, when planting. Compact plants grow just 6-8 in. tall. The most common insect problem are mites. Most insect problems can be effectively treated with insecticidal soaps and milder insecticides like Sevin. Disease problems are not very common. 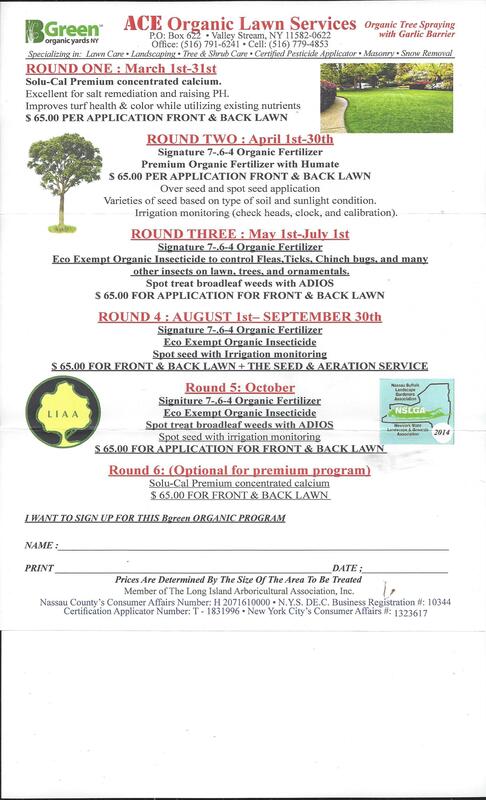 If problems occur, treat early with a fungicide.